Words by Kevin Doocey on May 17, 2011 . It was great on Sunday to sit back and watch both Birmingham vs. Fulham & Wigan Athletic vs. West Ham carefree. We did not need to worry about Newcastle United because we had guaranteed our safety a week earlier. Also, looking at Birmingham, Wigan and West Ham - you might also remember that we beat them all away from home this season, and indeed managed to get 16 out of a possible 18 points from those three troubled teams. That explains why we are only 3 points off 8th position, and not in a relegation scrap. Either way, the two matches left for a last day finale in the Premier League - something we played a part in a couple of seasons back. From watching Wigan, you have to say they’ve improved considerably and are giving their best to stay in the Barclays Premier League. Roberto Martinez tries to get them to play smooth football, plenty of passing and there were some very nice pieces of play at the DW Stadium on Sunday, aided by a very dodgy West Ham defence - and an unreliable goalkeeper. The likes of Victor Moses, Charles N’Zogbia, Hugo Rodallega and even Maynor Figueroa linked up well - but they lacked a real cutting edge at times. They got the worst possible with Demba Ba scoring two quickfire goals - it looked as if Wigan were in even worse trouble. However, after the break; an absolutely inch perfect free-kick from Charles N’Zogbia saw the top corner, and the Irishman Connor Salmon slotted home to complete the comeback. As both teams went flat out for a priceless winner - Carlton Cole probably had the best chance to grab it. Thomas Hitzlsperger put it right at the Englishman’s feet from 3 yards out, but somehow he managed to scoop it the other side of the post in some sort of circus trick when it was easier to score. How this guy misses these chances is beyond me. Add that to the fact we’ve been linked with a £9m bid for the England capped forward - no chance I’d pay that sum for him, and their back 4! As we know, former Toon lad N’Zogbia went on the crack a winner in, in the 93rd minute and relegated West Ham whilst keeping Wigan’s hopes of a Premier League great escape alive. I was impressed by N’Zogbia as I have been all season. His brace against us at St.James’ Park put people thinking that we might have sold a player that is only going to get better, and is still a very young lad. N’Zogbia has been the sole force behind Wigan this season, scoring quite a few goals whilst assisting much of the others. If Roberto Martinez’s side manage to stay in the Premier League this season it will be mainly down to the Frenchman. However, we have to consider that if Wigan fail to get anything away to Stoke City on the last day - then they will for definite be relegated to the nPower Championship and as you expect a lot of their players would look to leave the DW Stadium. If Wigan lose 1-0 to Stoke City on Sunday - but Birmingham and Blackpool are defeated 4-0 respectively away to Tottenham Hotspurs & Manchester United then they would stay up virtue of a better goal difference. Now that was a quick calculation and I might even be slightly wrong with my figures, however you get the point - it’s a long shot to say the least. Realistically speaking - if Wigan beat Stoke and the rest lose then they will stay in the Premier League. I still expect them to get relegated if I’m honest and I would certainly hope Alan Pardew would look towards resigning Charles N’Zogbia and maybe even adding Hugo Rodallega to our strikers. Maybe we could do a double deal, £15m for both of them and we’ll even throw in Alan Smith.. The question for me at least is whether N’Zogbia would considering coming back considering the circumstances in which he left St.James’ Park. I’d hope he would as Andy Carroll & Joe Kinnear are no longer there - two guys that he wasn’t great friends with to say the least! 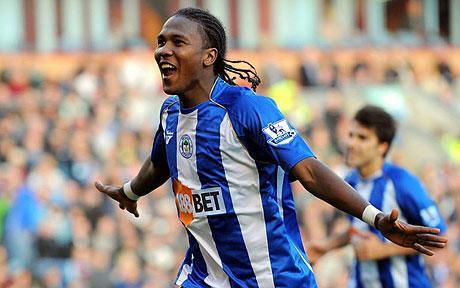 Would you like Charlie back on Tyneside, or even the Columbian Rodallega to wear a Black and White jersey next season? I for one would - but hopefully they’d be only 2 of five or six arrivals into Newcastle International Airport this summer. I dont think Newcastle would be able to get N'zogbia due to the bigger clubs that are already interested in the player. Defiantly N'zogbia, not too sure about Rodaellga but I don't think we will go for him in anyways but we've already bid for Zog in January so will probably go back in for him again.